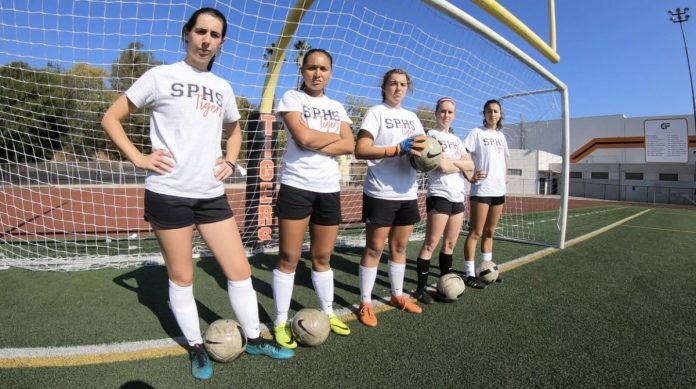 PHOTO: Johnathan Khamis | SouthPasadenan.com | Tigers Girls Soccer Varsity players from left to right - Senior, Uma Hornish, Junior Jessica Lat, Senior Noemi Howland, Senior Rainey Tilley and Senior Alyssa (AJ) Bonk. After a rough start to the week, South Pasadena High’s girls’ soccer team responded with a key victory over La Cañada on Thursday to maintain first place in the Rio Hondo League. The Tigers, who dropped a 2-1 contest to rival San Marino last Tuesday, battled back from the setback and took out their disappointment on the Spartans two days later. Let the good times roll again as South Pasadena has a one game lock on first place in league play at 4-1-1 (11-3-1 overall), ahead of second place San Marino at 3-2-1 (13-2-2) and La Canada with a 2-3-1 mark (5-9-1). All the scoring in the La Canada game came in the second half. The Spartans tallied first to lead 1-0 before the Tigers’ Uma Hornish tied it, confidently booting in a penalty kick in the left corner of the goal after teammate Jenna Noueihed was fouled. The Tigers went on top 2-1 as Noueihed beat a Spartan defender to the ball along the left sideline and sent a crossing pass to Hornish, who slotted the ball past the outstretched arms of the La Canada goalkeeper. The goal was a big one as the Tigers held off the Spartans the rest of the way. It was a big bounce back victory by a team determined to shake off the narrow loss to San Marino earlier in the week. In that battle, the Titans scored in the first six minutes of play. The Tigers evened it with a goal by Hornish, off an assist by Lorraine Tilley, to end the half. San Marino scored with about 14 minutes to go in game and the Titans held on for the win. The Titans kept South Pasadena goalie Noemi Howland busy as she made 14 saves on the day. The Tigers will have an opportunity to record a sound victory in a rare Saturday match, this one at home against 1-2-1 Monrovia. It will be Senior Night with a special ceremony following the 5 p.m. match to honor those leaving the program. The junior varsity plays the Wildcats at 3:30 p.m.